“Stoopid Flakes” was just one a many names (and certainly the favorite among the people at Jim’s company) considered for an actual Swedish Chef breakfast cereal eventually produced by Post. While “Croonchy Stars” was the final name choice for the product that appeared in super markets in 1988, much fun was had in the studio as they tested commercials for various versions. See production materials from the Stoopid Flakes test and learn more about the Swedish Chef’s cereal. 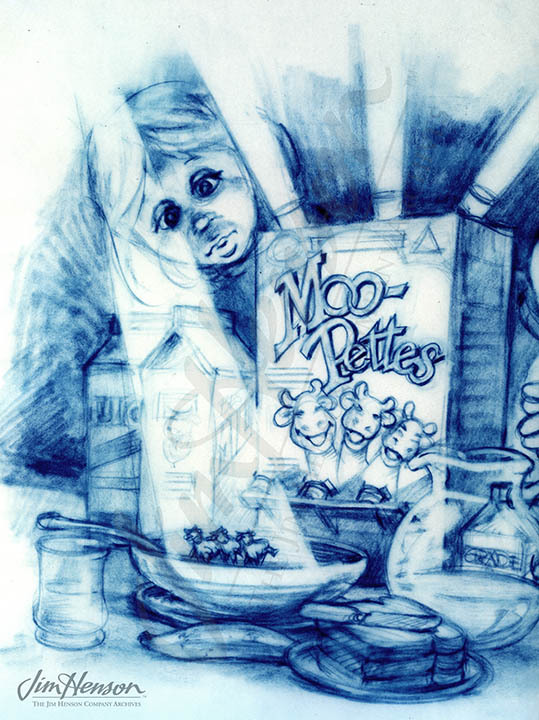 Michael Frith’s concept for Moopettes cow-shaped Swedish Chef cereal advertisement. This entry was posted in 11-November '86, 1986 and tagged Croonchy Stars, Stoopid Flakes, Swedish Chef. Bookmark the permalink.